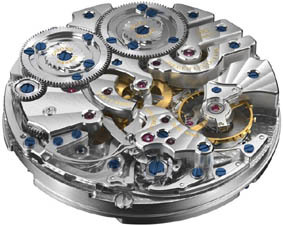 Many connoisseurs of high-end timepieces consider blued screws in the movement to be an absolute necessity. However, the technology used to achieve that signature hue is still a mystery to many. Actually, there are 2 processes: one employed by large manufacturers, such as Jaeger-LeCoultre, who require large quantities of high quality blued screws. Another method is used by who only needs small quantities. The first procedure uses a special, electrically heated bluing kiln that rotates several times a minute with precise temperature control. Its center is an open-ended ceramic tube with a diameter of approximately 5 cm. To produce dark blue screws, the temperature is set to 290°C. A few thousand tiny screws are placed in a small, steel trough - with a volume of only a few cubic centimeters - and inserted into the base of the ceramic tube. The slow revolution of the kiln ensures that the loose screws remain in continuous motion and are evenly exposed to the atmospheric oxygen without becoming damaged. This process creates a homogeneous, colorless film on the screws with a thickness of a few hundred nanometers. The layer is made of Fe3O4, a type of iron oxide, which permits tempered colors or interference effects. The same phenomenon is seen in soap bubbles and floating oily films, with the interference of light reflecting on either the surface or the back of the film. When the thickness of the film equals exactly one-half of a certain wavelength of light, the two reflecting waves for a specific color will disappear. The remainder of the reflecting natural or artificial light will then appear as a color. The wavelengths of visible light range between 750 nanometers (red) to 400 nanometers (violet). Different colors can be achieved depending on the thickness of the film. A thin film will show yellow, since the short waves of blue light will be eliminated. A thicker film will show blue, because the longer waves of light are eliminated this time. In the bluing kiln, the screws initially achieve a yellowish tone. As the oxidation time increases, the color changes to straw yellow, then to gold, brown, red, purple, violet and, finally, the desired dark blue color. This is because the oxide film becomes thicker and thicker. Additional heating will cause the oxidation to produce colors such as cornflower blue, light blue and, finally, dark gray. The duration of the heat treatment is extremely critical and can vary considerable within a period of a few hours. Depending on the size of the screws and the tolerance of the thermostat, the time required to achieve the dark blue color may vary between 9 and 13 minutes. An expert in the bluing process observes each morning's first batch continuously, determines the correct time period for the day, and sets the alarm signal. The components must always be checked towards the end of each time period. This ensures the exact consistency of the color tone for each and every batch. Screws that have achieved the proper dark blue color in the kiln - especially on the head and within the slot - are immersed in an enamel container filled with mineral oil, which stops the oxidation process immediately.